Quite a few Facebook users have lauded Soumya for a taking a brave stand against Iran's compulsory headscarf law. The Grandmaster from India has decided to not travel to the Islamist Republic for a continental tournament next month. Grandmaster Soumya Swaminathan's decision to not to travel to Iran due to the Islamic Republic's law that makes women athletes wear headscarves during international tournaments has been met with a lot of positive reactions. The 29-year-old, who will be skipping the Asian Team Test Championship in the West Asian country between July 26 and August 4, took to Facebook to slam the Iranian law on headscarf, saying it was in "direct violation" of her "basic human rights". 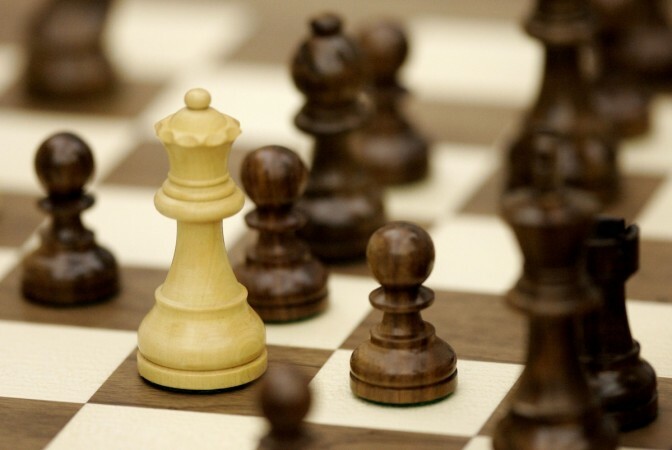 Notably, the world number 97 women's player had agreed to be a part of the Indian team when the chess tournament was initially scheduled to be held in Bangladesh. However, a venue change has forced her to take a decision that she "deeply regrets". The presence of hijab-wearing international athletes is becoming increasingly common at the international level. Even Muslim Americans in the United States, including Rio Olympic bronze medalist Ibtihaj Muhammad, have competed at the highest level, wearing hijabs. However, Soumya is of the view that religious dress code cannot be forced upon anyone, especially at such high-profile international events. Notably, the winning team at the continental team championship will get a direct berth to world team championships. "I find the Iranian law of compulsory Headscarf to be in direct violation of my basic Human Rights including my right to freedom of expression, and right to freedom of thought, conscience and religion. It seems that under the present circumstances, the only way for me to protect my rights is not to go to Iran," the world number 97 added. "I am very disappointed to see that player's rights and welfare are given such less importance while allotting and/or organising official championships. "I understand the organisers expecting us to wear our National Team Dress or Formals or Sporting attire for our games during official championships, but surely there is no place for an enforceable religious dress code in Sports. "It is a huge honour for me to represent India every time I am selected in the National Team and I deeply regret that I will be unable to participate in such an important championship. While we sportspersons are willing to make several adjustments for the sake of our sport, always giving it top priority in our life, some things simply cannot be compromised." Quite a few Facebook users lauded Soumya for exercising her right to refuse even as her post went viral on social media. "You did the right thing.. If any country imposes you to do what is wrong u have the right to refuse.. Iran wants us to wear burka veil why.. Its our right to say No.. I appreciate you.. THEY have to change their mindset.. I am happy you refused to toe their line... Congratulations.. You are a WINNER (sic)," wrote Sanjay Mahara, a Facebook user, replying to Soumya's post. Screengrab of a comment on Soumya Swaminathan's Facebook post. When one of her followers questioned her decision and gave her an alternate idea on how she could have tackled the situation, Soumya was quick to respond by shedding more light on her decision. Screengrab of comment to Soumya Swaminathan's latest post on Facebook. 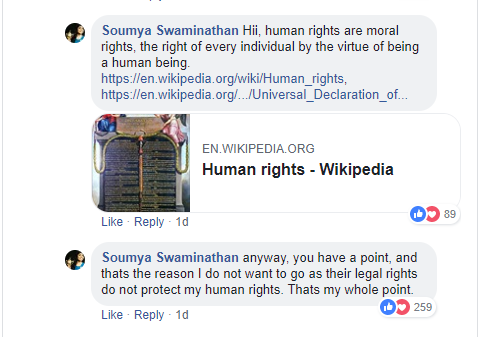 Here's Soumya Swaminathan's reply to one of the Facebook users' comment.